Vacation rental cottage. Sleeps 3, 0 bedroom, 1 bathroom. Dogs allowed. The Art Box is a studio cottage just minutes from downtown Langley and close to the Clinton Ferry for easy access to and from the Island. It's a perfect base to explore the entire island, with a full kitchen and bathroom, and separate living room from the queen bed sleeping area. It is nestled in the trees and beautifully landscaped to make you feel you have escaped all of life's stresses. The Art box is situated next to Rhythm Waters to create a combined rental if desired for more space, but still uniquely separated for privacy if rented separately. 4 NIGHT MINIMUM IN JULY AND AUGUST. 2 DOG MAXIMUM. 1. We called at off hours reported water tank leaking issue to the answering service. The manager called back quickly and came over to resolve the problem. 2. We asked for BBQ grill brush, it was delivered the next day. 1. The stone path from parking to the rental was not accessible as it showed in the photos, it’s covered by the bushes. Some trimming perhaps? outdoor floormat to wipe off the dirty shoes before entering the rental. 3. Bedroom needed more light. Although the property manager brought over couple lamps, it was still dark. 4. The large see through glass door doesn’t have blinds. 5. Need coffee table, end tables or night stand. We didn't have a place for small items like wallet, watch, glasses, etc. 7. There’s no TV or Radio, but a speaker to play iPhone music would be nice. Thank you for your review! We will definitely trim back the shrubs encroaching on the path right away and have ordered more lamps. We will also take your other suggestions to the owner. Our goal is always to give every guest an enjoyable stay. A Smart TV is also being installed very soon to stream and there is a TV and DVD player at the home currently, but no cable access at this property. Thanks again for your comments and we hope you can stay again in the future! This was the most incredible place. This small home had everything I needed to enjoy my stay. It was exceptionally easy to book at the last minute and the rental company was awesome. The location was beautifully situatied in the woods and we had a doe visit us every morning. I highly recommend it and hope to some day revisit. Thank you so much for your review. Our office staff tries to be very helpful so thanks for the comments. We are happy to hear you had a great stay on Whidbey Island! We have lots of deer on the island, so happy you got to enjoy them. The Art box was a a serene little rental located the perfect distance outside Langley. 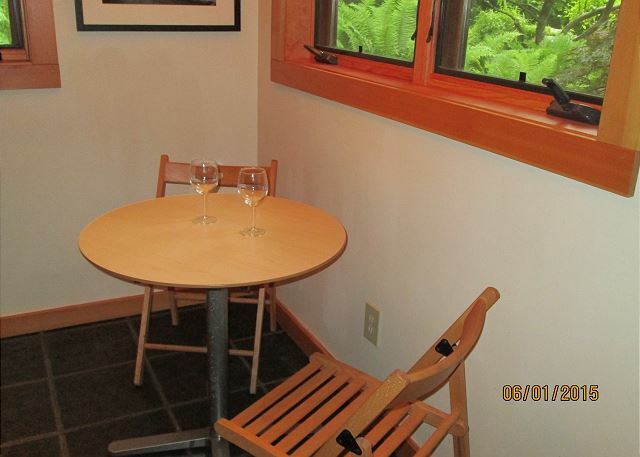 The pros of this rental would be its location, beautiful outdoor sitting area, and size. While it's only a studio, 2 people really don't need anymore room. However, I probably wouldn't consider staying there much longer than 4/5 nights has the kitchen isn't that well equipped for cooking up a storm. The cons would be the lack of proper furniture. While the house is beautifully finished, a proper sized couch, dining table and something to put your suitcase on would have been nice. All in all, beautiful studio in a beautiful location. The price was totally fair for what you're receiving which was reassuring. If you're looking for a quiet getaway for yourself and one other, this is a great option! Thank you so much for your comments! 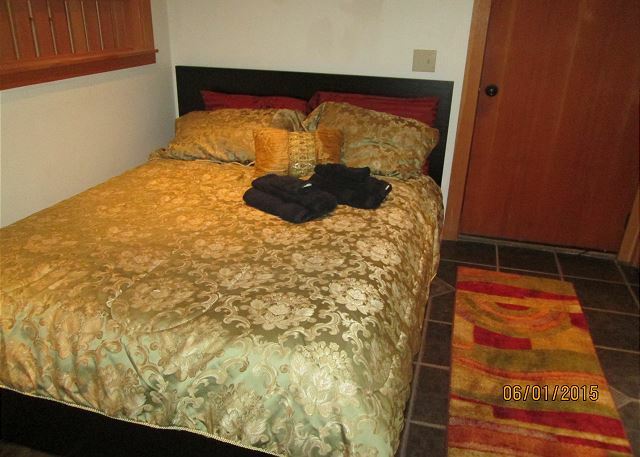 This property is smaller and is a studio, and, like you said, only accommodates two - three people. Because of the size of this rental, the furniture is naturally smaller to make sure there is still enough space for those staying in the home. We do have a suitcase rack, but it may not have been in an easily-accessed location, so we'll make sure that that is out and available for future renters. Thanks for your review! Very friendly staff, stunning landscaping, quiet, and comfy. Loved sitting by the fire place at night and waking up to the singing birds. Perfectly named "art box" as me and my little ones spent many hours painting, and creating beautiful art work! Will definitely return. We are so glad you enjoyed your stay! Thank you for your review! Rented with my son's in-laws as we gathered on the island for our mutual oldest grandson's wedding. We each had an adult son spend part of the time with us. It was great to have the extra room and bath next door! We had the bride and groom and their parents over for some photos in the stunningly beautiful backyard and prepared a great meal in the spacious well-equipped kitchen. Only issue was the place is so fantastic that the dirty windows and pealing deck seemed out of character with the whole rest of the ambiance. We surmised since it was early spring perhaps these would soon be on the list of to do's. We WILL rent again, it is truly amazing and you take some of the serenity home with you when you dream you're still there. Thank you for your helpful comments. The deck has been repainted and this is actually in regards to Rhythm Waters (the neighboring house). We're glad you had a good time! Thank you for your review! We simply needs a bed for two nights and the Art Box was perfect. It was very clean, warm, and a comfortable space. While very small, it has everything you need (except a hair dryer). There is a sulphur smell to the well water but it didn't taste of sulphur. The bed is too soft and both my husband and I were hurting each morning but the peace and quiet kept us sleeping through the night. My guests were happy with the quint little cabin. One of their comment was that there is no place to put a suitcase. Elderly people can't very well put a case on the floor So I would suggest to add one of these folding luggage rack that one can find in hotel rooms. Thank you Madeleine. That is a great suggestion! This is a cute little hideaway in the woods.Everything is new and nicely appointed. Best for one or two to stay here-it is small. Lacks some amenities- cell service very difficult and no tv,but internet okay. Cute Little Cabin, nice location, very close to Langley. Small but charming. 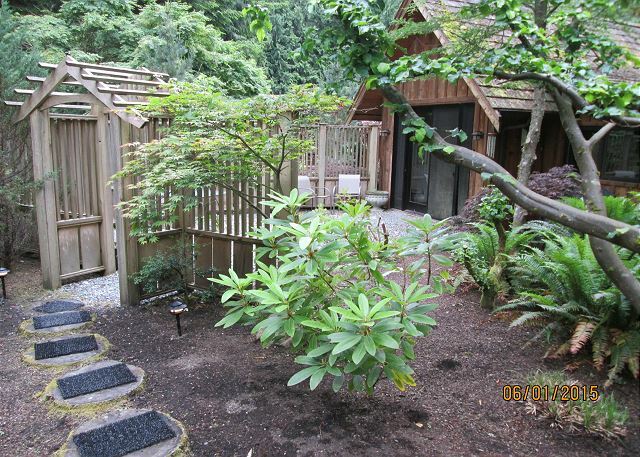 Great quiet location, pleasant with gorgeous landscaping. Nice private outdoor patio space. Would appreciate just a bit more space for personal belongings, like a small dresser or tabletop somewhere. This cabin was an ok rental when considering price point. Fairly centrally located on Whidbey Island for wineries and downtown Langley. Amenities at cabin are basic to none. 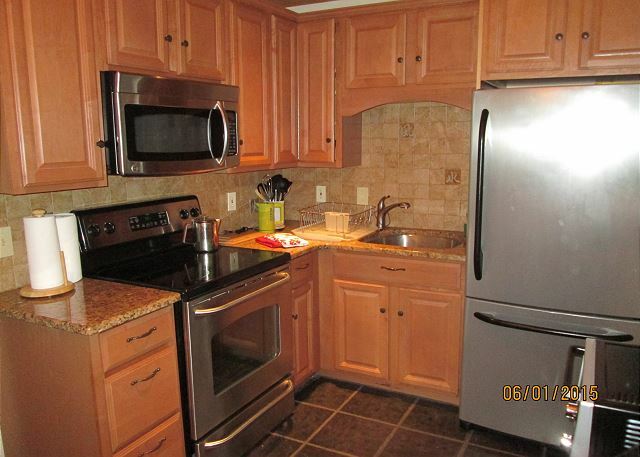 No dishwasher, no kitchen equipment beyond basic items (pots/pans, dishes, silverware). Had to mix salads in pots and pans, no can opener, etc. Basic things I have come to expect in a VRBO. Biggest complaint: Received no warning on quality/state of water. I understand that it is well water, however, the pungent smell of sulphur and rotten eggs made the water undrinkable. Having grown up in the PNW and having lots of experiences with well water, this needs a new system, or to be treated, I am not sure it is potable. The first night we were there we had no water as it was undrinkable. With warning, we would have brought water with us. The bed was extremely uncomfortable. Other than that, charming and rustic cabin in the woods, good for couples looking to get away to a cabin. (4) this cottage sits in front of another rental. It's still private, but the people in the other rental house were freaked out that we were there and asked us to "stay in our own space." My recommendation is to have the company inform those other renters that you will be staying in the small house in front. Hello Mary Ellen, We appreciate your feedback and are glad that overall you enjoyed your stay. Whidbey Island has a lot of wooded areas and water and seasonally we do get flies and other bugs which tend not to last very long. As a policy all of our Tara Vacation Rentals are supplied with 2 rolls of toilet paper per bathroom.--a "starter supply" as noted in the check in packet. We are sorry you were supplied with only one roll and have addressed it with the housekeeper. This studio is near a bigger rental, and both the instructions in the house and in the check in packet ask that the privacy of the other renters be respected. Each rental comes with its own house and grounds. This apartment has a small courtyard area specifically for the use of its renters.